Thank you to everyone who submitted photos in the "Spackle Lohan's Face" contest. I received thousands of entries and I spent hours mulling over each and every one of them. I was finally able to come up with a winner. 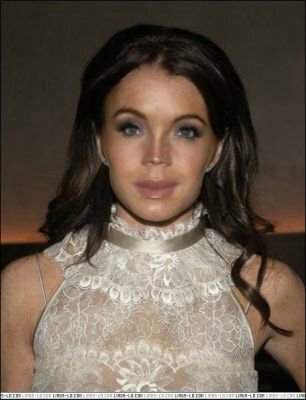 Thanks to Jenny for making Lohan look like a combination of Joan Rivers, Posh Spice, and a melted piece of plastic. Now that's a great nose job......its not going to slide off or anything. she looks like Michael Jackson!